Almost a year to the day I started my Mark VII tricorder project, I’m onto the Mark VI. The Mark VI is actually the predecessor to the Mark VII. It was seen on earlier seasons of Star Trek: The Next Generation and featured a less complex top array of LEDs. Instead, the top of the tricorder housed a small, detachable hand-scanner similar to the one seen on the medical tricorder. 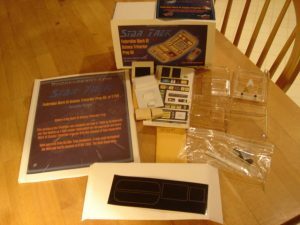 First off, this is another great kit brought to you by Roddenberry.com. Just check under their prop section. 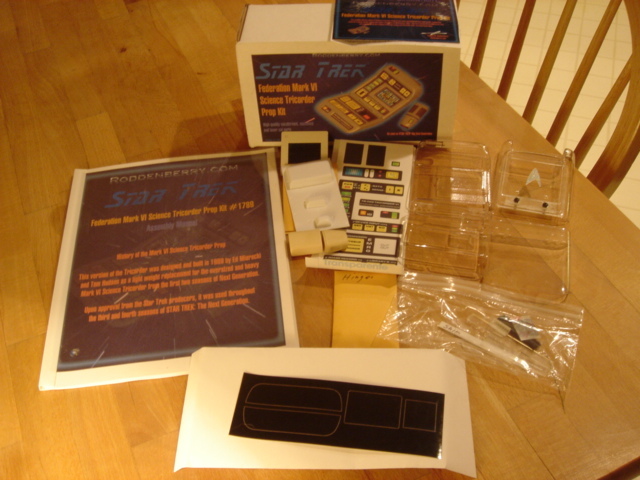 This is the 3rd season version of the Mark VI tricorder kit (#1789). The great thing about this kit, is that it was derived from the same masters Ed Mariecki used to create the original props! You can get much closer to the real thing than that. The other major difference between this and Mark VII kit I built is that this kit is vacuformed instead of being resin cast. The nice thing about this is that the body is already very smooth, and it’s clear, so all you need to do for electronics is mask off the appropriate areas…much easier than getting LEDs to align up to holes. ← Clear Coat and Done!